So Zimmerman is healthy enough to run the bases, but not get out on the field? Especially against a lefty in a must-win game? Don't buy it. Think it's just a crappy decision by Matt. Pretty hard to feel good about the Nats if all we're capable of is NLDS bounce-outs, and you know Rizzo's not going to make the right choices to put them over the hump. And at least Davey Johnson won two post-season games. I buy what he says about career numbers. Also, if you PH you have to run the bases once. If you field, things happen. I believe in his fielding as much as anyone but if he made an error everyone would call for Williams' head anyhow. This is our best lineup. This is the lineup that has to figure out how to hit or spend the off season feeling like crap. Aside from Lobaton for defense I'm okay with it. I'd really like to see him get his spot. Let the game play out FFS. I'm keeping the faith today and think we have a decent shot at winning today's game. All we need to do is string together a few clutch hits, that have been missing this series. 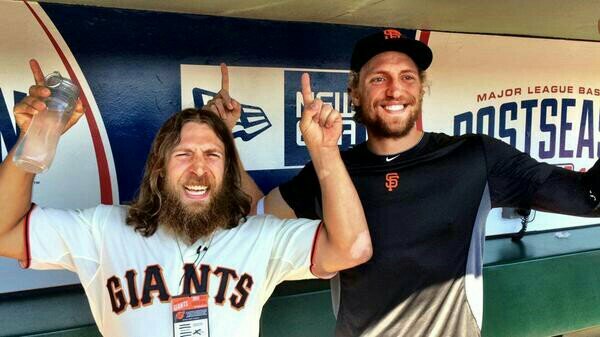 Daniel Bryan has betrayed the DC Wrestling fans. 2:00 p.m. (PDT) start should make for interesting late-game lighting effects. Better jump out to an early lead. With the amount of times Ryan Zimmerman has shown up this season, he might as well be our Brock Lesnar. Fire Matt Williams and hire Paul Heyman. He's a master motivator, as evident by when he ran ECW. Let someone like KNORR run the baseball side of things. Bowden just mentioned on MLB Network Radio that the Nats have faced Bumgarner six times in the past three seasons. Our record? 1-5. We'd be 5-1 against him if we still had Comrades Felipe Lopez, Willy Mo Pena, and Austin Kearns in our lineup. Actually, no. He's speaks rather glowingly about the Nats when he's a co-host on Inside Pitch (as he is today). Blob Wadsdon is about to be interviewed. And he's wrong. He's 2-3 against the Nationals. Do or die humans. I'm actually in a waiting room at ICU in Abingdon Hospital outside of Philly waiting for my sister to come out from under sedation after heart surgery. Needless to say, send along your prayers if you are so inclined. All is going well, but there's no MLB channel feed and I can't stream the game SO the wife is going to Skype me and put her laptop in front of the TV at home YIKES! The things we do for baseball. I'm wearing a homemade gnome hat and I'm this close to eating a mayo and banana sandwich. Let's do this! C'mon Nats, do not go quietly into the night! The shadows are going to be pretty bad by the 5th or so inning - gotta score early Nats. I feel bad just reading that. I hated that performance more than your usual patriotic wankery. Perhaps it's showing somewhere today.